With the amazing technological advances in the medical field, it can be hard to remember that not all advances give us what we actually want. In a previous post, I mentioned that medical imaging doesn’t tell you the cause of your back pain. 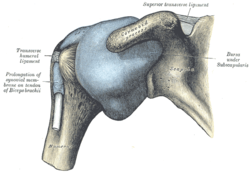 Today, I want to tell you that it also doesn’t necessarily tell you the cause of shoulder pain. A fiery lady named Lorna came into my office a few weeks ago at the behest of one of my other clients to see what could be done about her shoulder. After months of shoulder pain, weeks of PT and promises of surgery, I went to see Matt. After just one session with him I can tell I have found the road to recovery. Matt is very patient and encouraging. After a few more sessions I think I might even be able to challenge him to a hot game of hockey!!! When Lorna walked in, she was unable to lift her left arm out to the side beyond about 30 to 35 degrees from her body. She physically couldn’t do it. It hurt. She also couldn’t lift her arm out in front of her beyond about 40-50 degrees without pain in the shoulder joint. An MRI by a doctor showed an old rotator cuff injury which seemed too old to be “fixed” as well as signs of bone spurs within the shoulder joint. So the doctor told her that if physical therapy didn’t help, she should consider surgery to clear out the bone spurs. After several weeks of rotator cuff strengthening exercises and some painful attempts to restore ROM, she was no better off than when she had started. But after one session at Upright Health, Lorna dramatically improved. What ended up helping Lorna regain her range of motion in her first session with me? Restoring the proper alignment of the rest of Lorna’s body. She had a very strong asymmetry between the left and right sides of her back that was causing her whole torso to rotate. Her ribs were rotated, putting the shoulder blades into an odd position that did not allow for full range of motion. With a few preliminary exercises to restore some balance to the back muscles, she regained some motion in her shoulder joint, and with a few other stretches, she was able to bring her hand up over her head to point at the sky. And all it took was just over an hour of postural work (versus more than 3 weeks of physical therapy). So the lesson is that even if an image appears to tell you something, it might not. If medical images were fully, 100% conclusive, the doctor wouldn’t even have bothered telling Lorna to try physical therapy. If the bone spurs had really been the cause of her lack of range of motion, then no amount of rotator cuff strengthening would remove those bone spurs. The trick was that the lack of range of motion was coming from the twisting in her back — NOT from the bone spurs, and all you needed was your low-tech eyeballs to see the problem!